acquired from the estate of Dr Peter Sharratt (d. 2014). Sharratt was a linguist and lecturer in the School of Literatures, Languages and Cultures at the University of Edinburgh who published on Renaissance French sculpture. 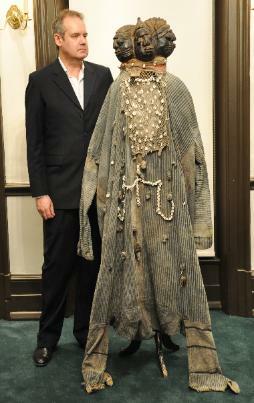 In his private life, he was an avid collector of tribal art, building up his collection over fifty years. During that time, he bought from UK dealers, collectors and auction houses. 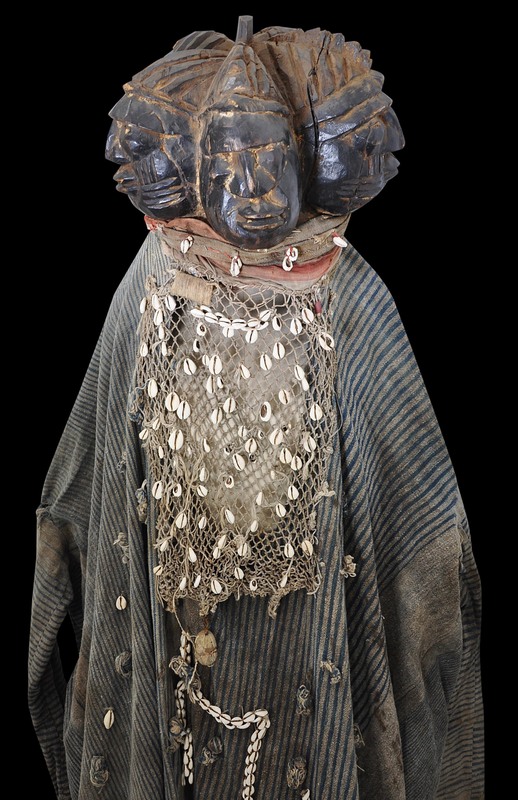 This full Yoruba dance costume comprises a large costume, a striking five-headed headdress, a face-net which covers the dancer’s face, strands of cowrie shells, and numerous talismanic charms. The headdress and costume are well-attached to one another and are integral to each other. 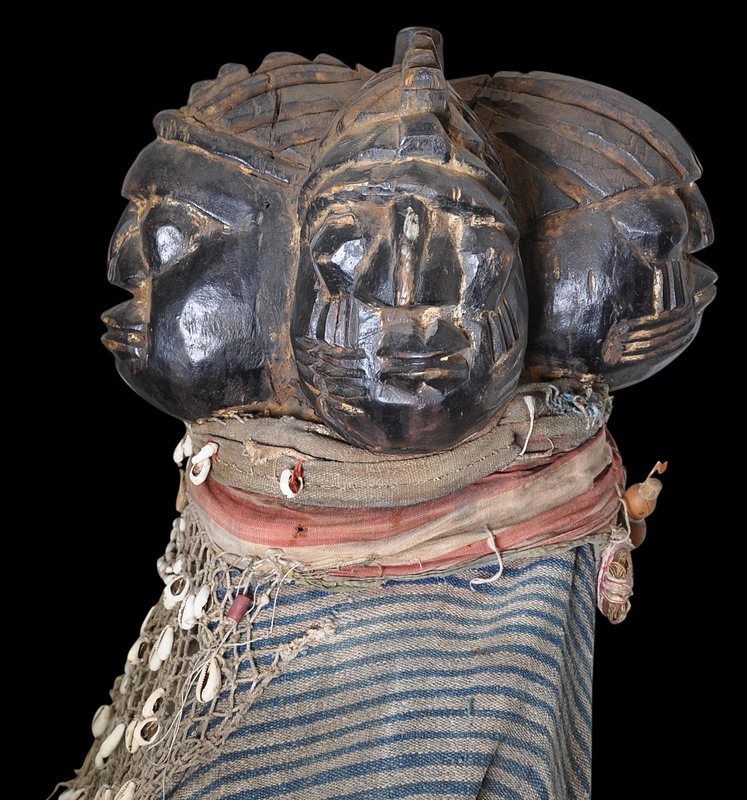 The headdress is carved as five co-joined heads from one piece of wood. The carving is forceful and concise. The five heads are arranged in Janus fashion – so that they look into five different directions. 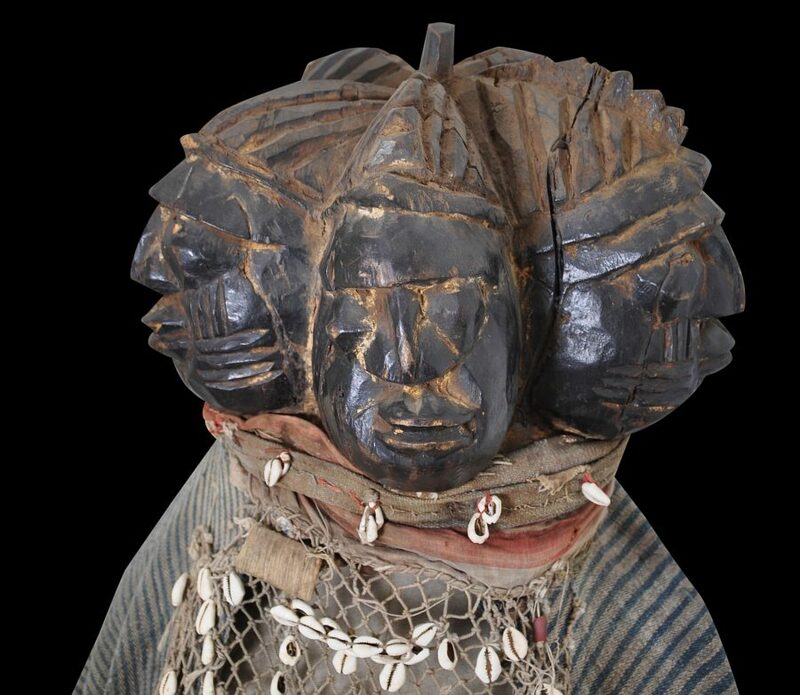 In Yorubaland, the metaphor of having multiple heads signifies intense watchfulness. Each head’s facial features are bold and strong. They are largely identical, except that scarifications are found alternately on three of the faces. Their eyes are diamond-shaped; the noses are strong; the nostrils are flared. The lips are pursed. 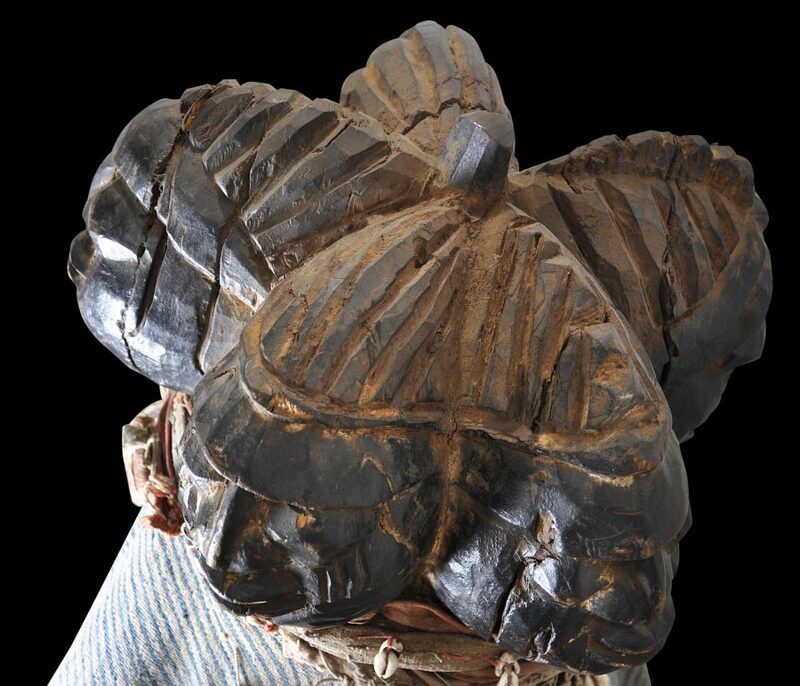 Each head appears to wear a ‘dog’s ears cap’ (fila eleti aja) with the brim folded over the forehead and ears. The textile used in the costume is a Yoruba stripweave. The sleeves and legs are long and include gloves and coverings for the feet so that the dancer’s body is entirely concealed. Magical charms are sewn and hung on the costume. 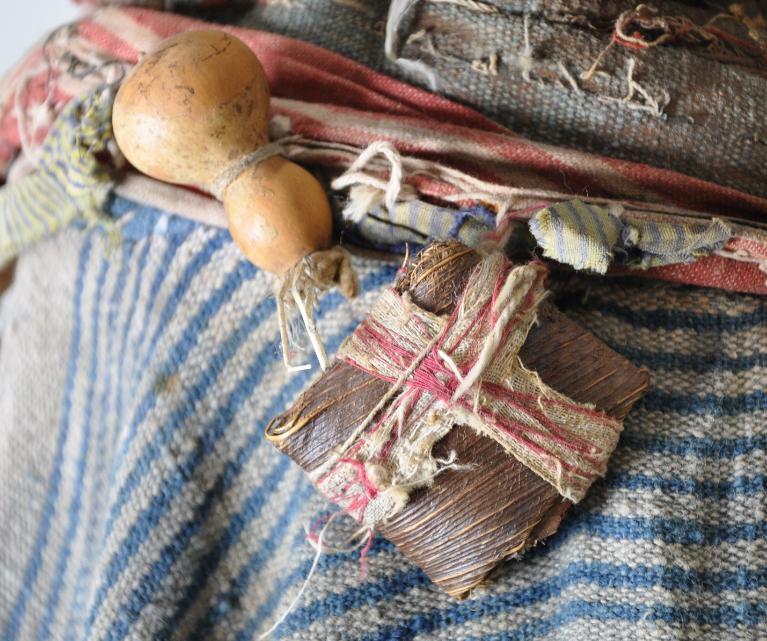 Dried gourds, small metal tools, small rectangular and spherical packages wrapped in vegetal fibres and beads are among the attached charms. 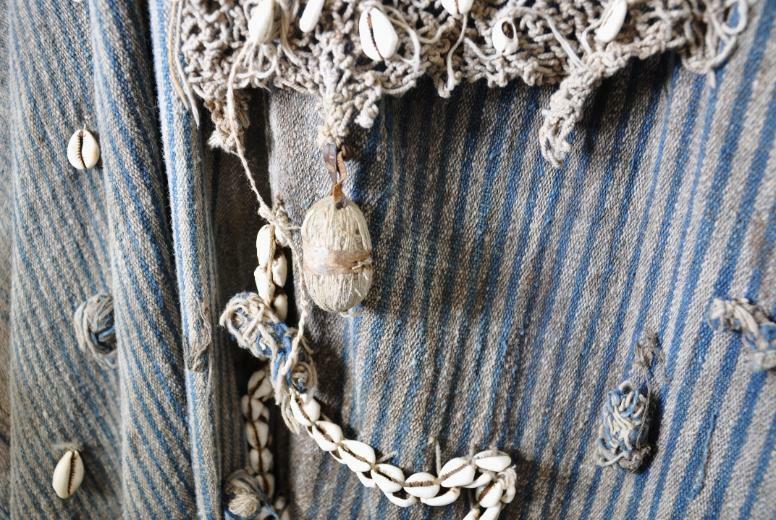 Strands of cowrie shells are sewn to the front of costume in an ‘M’ pattern. Numerous cowrie shells have also been sewn to the netting that covers the dancer’s face. Figural carvings with multiple co-joined heads in Yoruba art are rare. One example, a Shango staff (ose), can be found in Washington’s National Museum of African Art at the Smithsonian Institution. However, the headdress here has no traits that can be traced to Shango. Another example is an Oro mask and costume in the Afrika Museum in Berg en Dal, the Netherlands. This is attributed to the Egungun cult (Grootaers. 2002). Even though the heads on this mask are not co-joined, it has some resemblance to the headdress here. 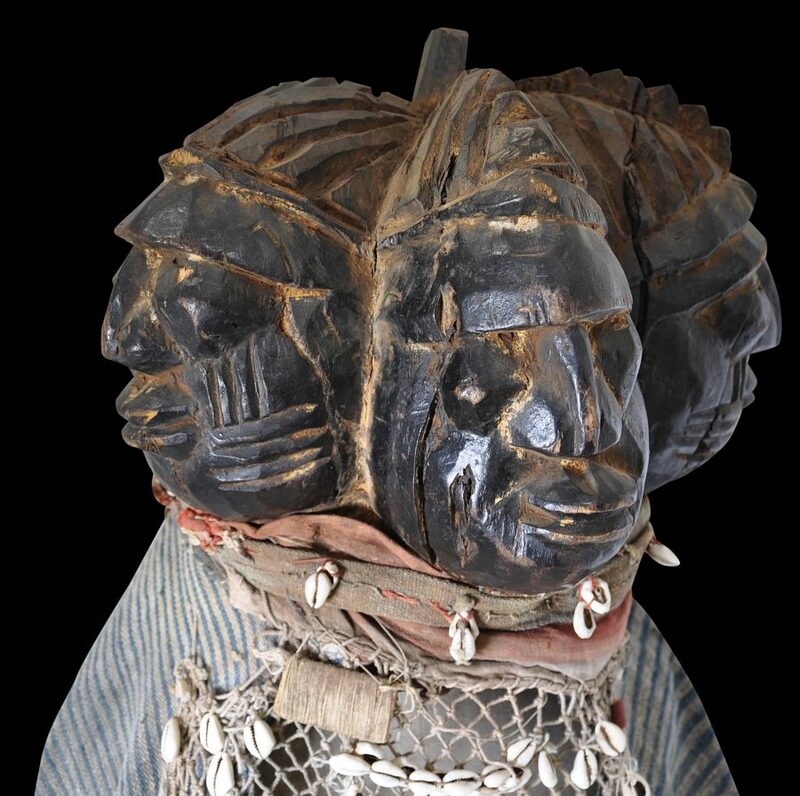 It is possible that the headdress has a link to Eshu, a Yoruba deity known for its mischievous behavior and its ability to deliver either prosperity or misery (Chemeche, 2013, p. 26). Eshu is sometimes portrayed with two faces and in this guise is a protector of travellers, an overseer of crossroads and a gatekeeper of entrances and exits. It is possible that the headdress here is meant to signify a similar function. Perhaps, the way that the faces alternately are scarified resembles the way Eshu shrine figures are arranged alternately by male and female. 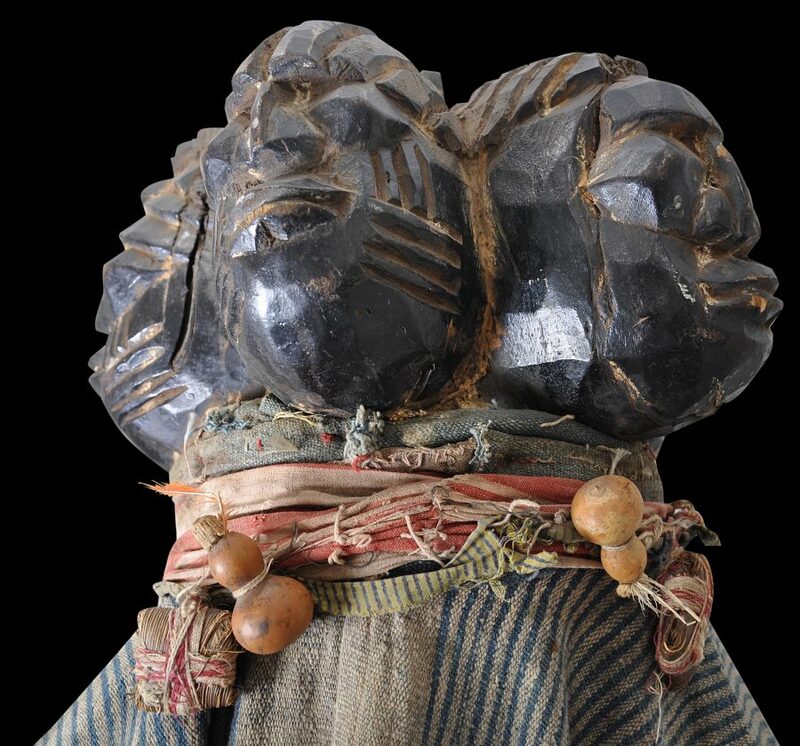 Eshu dance is well-documented but there are no records of corresponding Eshu headdresses. The headdress might be a little-known regional variant. The headdress has a dark glossy patina and shows signs of age and use. Expected shrinkage-related cracks are present but they are old and stable. 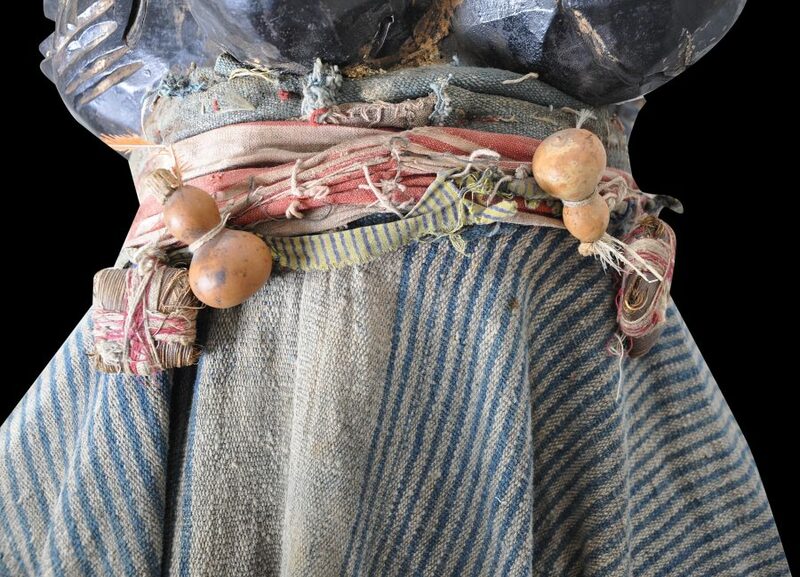 The costume has some fraying to the hands and feet and shows significant age and use. 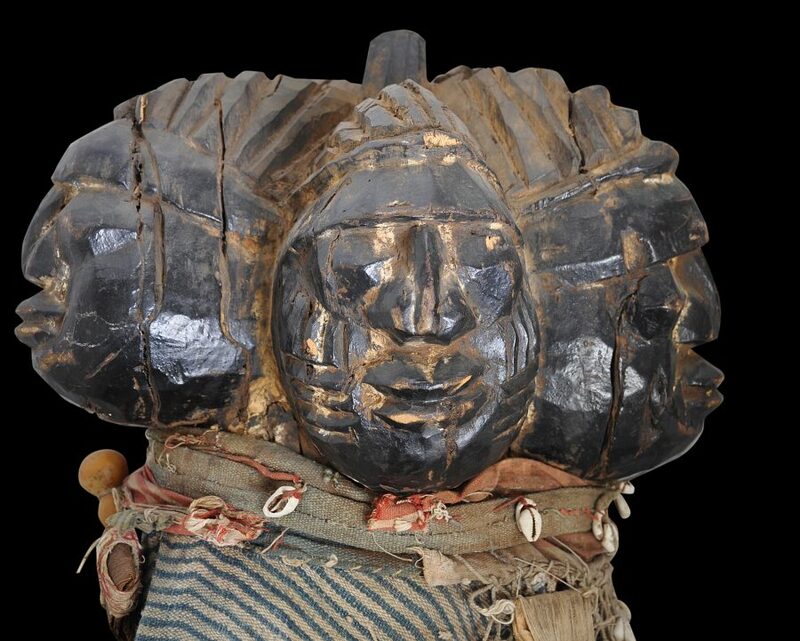 Overall, the costume and headdress is unusual and certainly sculpturally dramatic. Chemeche, G., Eshu: The Divine Trickster, Antique Collectors’ Club, 2013. Drewal, H. J. & M. T. Drewal, Gelede: Art and Female Power among the Yoruba, Indiana University Press, 1983. 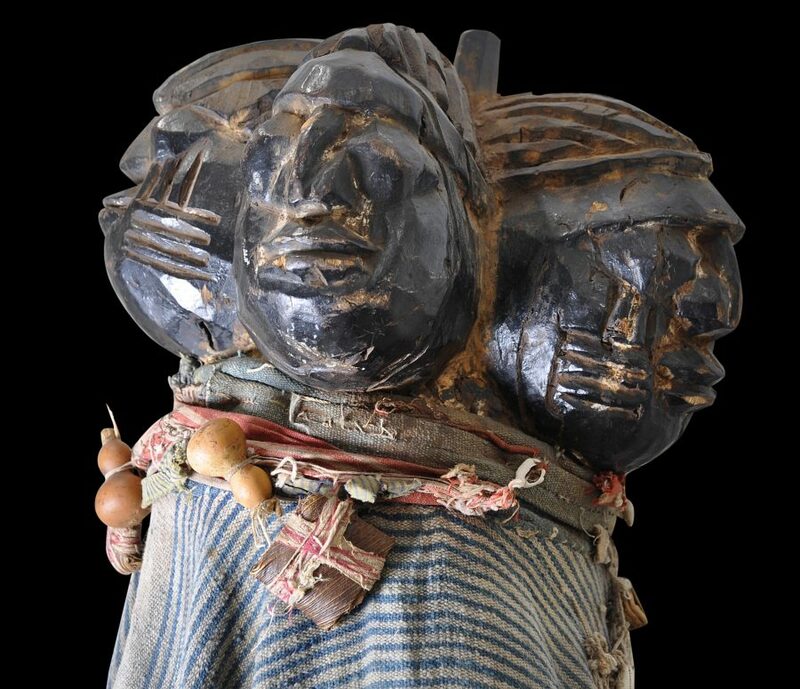 Fagg, W., J. Pemberton III & B. Holcombe, Yoruba: Sculpture of West Africa, Collins, 1982. Gillow, J., African Textiles: Colour and Creativity Across a Continent, Thames & Hudson, 2003. Lawal, B., The Gelede Spectacle: Art, Gender, and Social Harmony in an African Culture, University of Washington Press, 1996. Lawal, B., Yoruba, 5 Continents, 2012. Polo, F., Encyclopedia of the Ibeji, Ibeji Art, 2008. Price, C., Made in West Africa, Cassell & Collier Macmillan Publishers, 1975. Thompson, R. F., African Art in Motion: Icon and Act, University of California Press, 1974.